The trustee charged with recovering funds for the victims of Bernard Madoff's multi-billion dollar fraud scheme has filed lawsuits seeking nearly $20bn (£12.6bn) in damages. Irving Picard has charged nearly 60 people, including a key shareholder in Austria's Medici Bank. Mr Picard accused Sonja Kohn of "masterminding an illegal scheme" to help Madoff defraud investors. Earlier this week, Mr Picard sued HSBC bank for $9bn. It said it would defend itself "vigorously" against the claims. Similar suits have been filed against JP Morgan Chase and UBS banks. The latest string of lawsuits comes just days before the two-year mandate of the trustee expires. Mr Picard said Ms Kohn had "exploited her privileged relationship with Madoff to feed over $9.1bn of other people's money into his Ponzi scheme" for more than 20 years. "The illegal scheme enriched Kohn, her family and scores of other individuals and entities, including the largest banks in Austria and Italy," he said. Madoff admitted last year defrauding thousands of investors through a Ponzi scheme, which paid out using new investors' money rather than from any profits. The scheme, which had been running since the early 1990s, unravelled when Madoff's investors tried to withdraw about $7bn at the height of the economic downturn. Madoff could not produce the money. 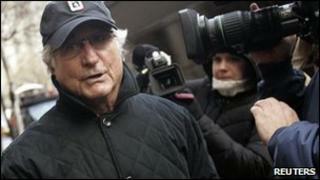 Madoff is serving 150 years for the fraud.